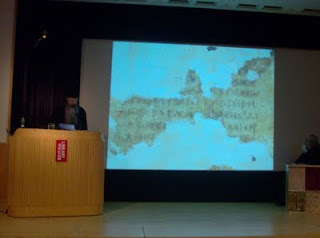 As I reported from the Codex Sinaiticus conference in July, Father Justin, librarian at St Catherine's monastery, announced in his presentation on the new finds of 1975 that most probably a new leaf of Codex Sinaiticus has recently been discovered in the binding of another codex by a scholar who is working on the bookbindings of the monastery. At this point it is unclear if and when the fragment will be removed from the binding. It may await future technological advancements. Father Justin's presentation was one of the best during this conference. Just like our Peter Head he really knew how to handle his Power Point. Father Justin has a very interesting background. He is actually an American, son of Baptist missionaries. Read an interview with Father Justin in Biblical Archaeology Review on-line, "An American Monk in Sinai." Dan Wallace reports from Father Justin's visit to Dallas in April here. The person who can be seen sitting in the panel to the right is the archbishop of the monastery, Archbishop Damianos, who had just spoken about "The Shepherd of Hermas and its inclusion in Codex Sinaiticus: almost Scripture." 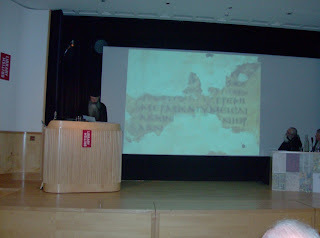 He spoke in Greek and the English translation appeared on the screen.